I have a few passions in my life…(she smiles) is it more than a few, when you need both hands and feet to count. The first few on top of the list besides art, food, photography, would have to be old antique roses (you know the ones with their fragrant perfumes, the ones that fill the whole room with their scent, and make you turn,stop, and smell the heart of a rose) china, white linen, the Victoriana Era, crystal, silver, and vintage hats and boxes…ok, the list is long. Back to the point of this new addition to the china section. 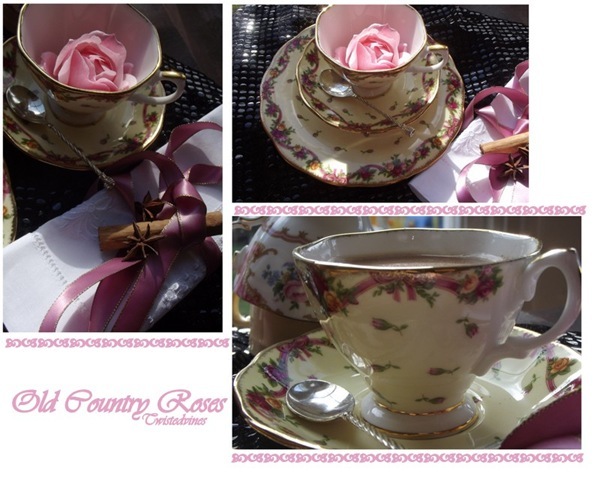 I was cast under a spell, to a discounted sale of items in a shop…I wanted not to buy, but just couldn’t resist this trio, Royal Albert, Bone China, Old Country Roses, Ruby Collection – Yellow Rosebud, Made in England, which is even rarer these days to find. An hour or maybe two passed and yes, I had a number of new additions to my collections. So this here, is my first time ever on an afternoon tea serenade with Yellow Rosebud. Royal Albert is completely ‘passionate about florals’. Royal Albert has been dedicated to English grace, elegance, and romance since Victorian times. 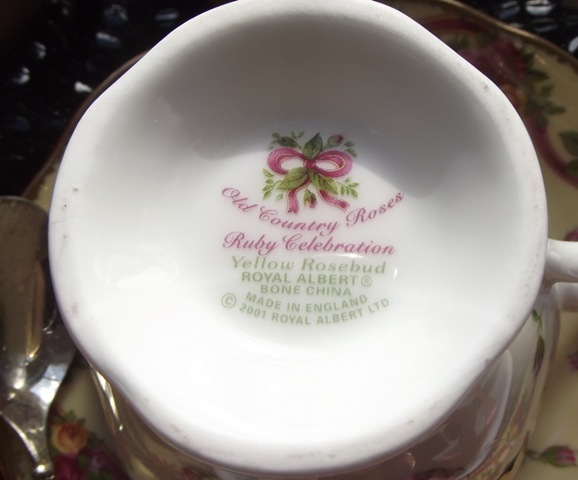 The story of Royal Albert stretches back over one hundred years to a small pottery business established by Thomas Wild, in Longton – one of the six towns that make up Stoke-on-Trent, “The Potteries”. Established in 1896, Royal Albert is inspired by everything English- the country garden and England’s national flower, the rose. 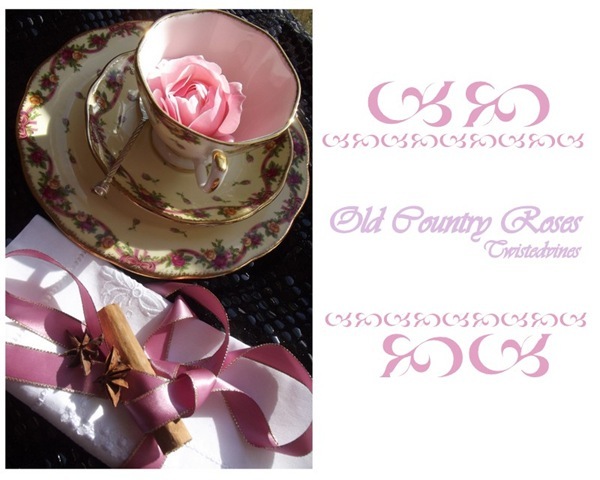 One of the most famous Royal Albert patterns is Old Country Roses. 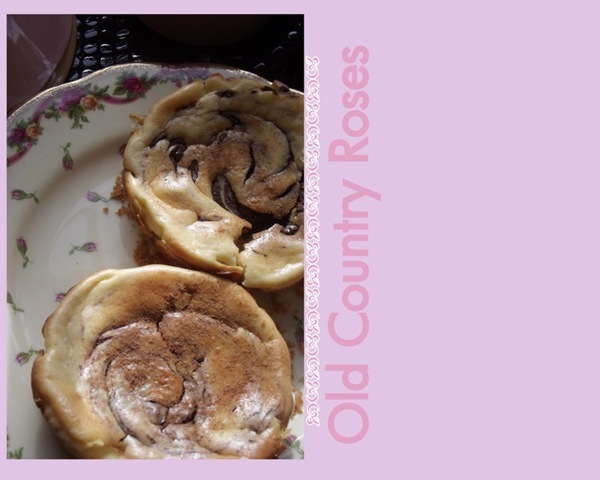 Launched in 1962, Old Country Roses was based on an older Royal Albert Pattern called Kings Ransom and continues to be one of the best selling fine bone china patterns in the world – selling more than 150 million pieces since its introduction. Excerpt from the Royal Albert site. 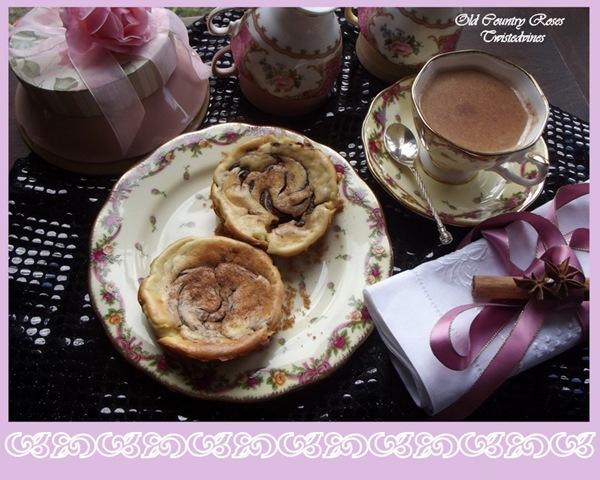 These petite Baked Banana Cheesecakes are delicious served warm, with a chai tea latte, a luscious creamy, cinnamon taste. Simply delicious! I love the pink bow surrounded by the smallest of delicate rosebuds. An afternoon sitting with Albert, and afternoon of delicious aroma’s of cinnamon…baked banana cheesecake lightly sprinkled with ground cinnamon and a rich chai latte with vanilla and cinnamon. 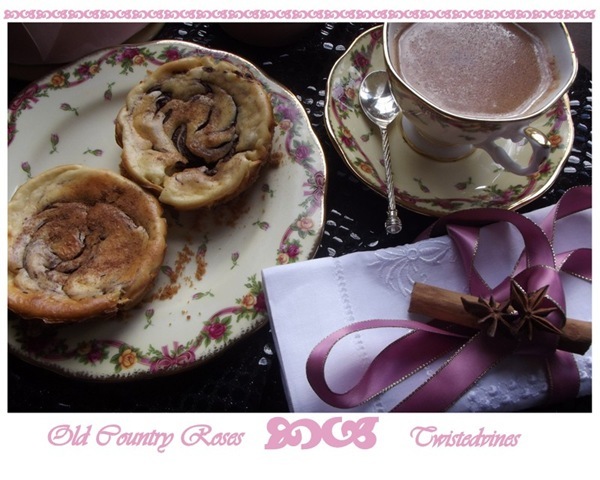 Chai (pronounced as a single syllable and rhymes with ‘pie’) is the word for tea in many parts of the world. It is a centuries-old beverage which has played an important role in many cultures. The spices used vary from region to region and among households in India. The most common are cardamom, cinnamon, ginger, cloves, and pepper. Indian chai produces a warming, soothing effect, acts as a natural digestive aid and gives one a wonderful sense of well being. It’s difficult to resist a second cup. Have you tried a chai tea latte? Try the recipe: 2 individual tea bags + 1 cup milk + 1 cup water + 1/4 cup packed brown sugar + 2 tablespoons french vanilla non-dairy creamer (coffeemate) + 1/2 teaspoon ground ginger + 1 teaspoon ground cinnamon + 1/4 teaspoon ground allspice. I find it easier to place the following ingredients into a coffee plunger or even a drip coffeemaker.Place the teabags, cinnamon, ginger and allspice add the water and brew as usual. Meanwhile in a saucepan combine the milk, brown sugar and creamer, cook and stir on medium heat until sugar has dissolved, pour milk mixture into cup, about half way, pour in tea mixture, sprinkle with cinnamon or nutmeg. 2 servings. Try it…I think you’ll like it! Let me know if you do! Thank you for joining me, and to all the hosts that I enjoy linking to, for the time YOU take to read and leave comments, you don’t know how much I look forward to them, they put a smile on my face. I am grateful for your beautiful postings – always a pleasure and a blessing to visit. Always such beauty and grace in your posts. The china is so pretty, strewn with those little rosebuds. Certainly easy to see why you favor this china pattern so much. It’s really quite beautiful, Yvette, and the setting has that Old World feel to it. I’m sure it is always commented upon whenever it’s in use. It must be striking. Thanks for visiting my blog. I like this china pattern, it’s a classic. Yvette, your new tea set is lovely,I like it more so than Old Country Roses. It is so much more delicate. Love the shape of the cup too. I am going to try your recipe for tea, it sounds so warming. I love Chai tea latte and I like your post. Yvette, your post is such a pretty one. I can fully appreciate your affection for the scent and beauty of sweet smelling roses. China teacups featuring them is also a treat! Hello Yvette, your new dishes are gorgeous! Everyone loves OCR and this pattern of it is lovely. I am glad you found it. The banana cheesecake looks delicious! I do love Chai too. I make it differently though, half milk and water in a pan with cardamon pods, cloves and cinnamon sticks (all crushed). I bring it to a boil, and then add Assam tea bags and a sweetener, like raw sugar. Yours has more spices and sounds delicious too! Thank you so much for sharing, I always love trying new recipes. Yvette, your china is simply exquisite! How wonderful to find it! Your banana cheesecake is very tempting and would be lovely with a cup of Chai, which I love by the way. I do like mine black however. I take both my coffee and tea black. Thank you for coming by to have tea with me and have yourself a wonderful day. Your Royal Albert trio is so beautiful! And I enjoyed reading about the company and their popular patterns. I really enjoyed your three Royal Albert Cups n Saucers you showed, I love the old Country Roses, so pretty and enjoyed the history of Royal albert. Thank you for sharing. Yvette, your tea post is fabulous! Such wonderful information and inspiration as well as beautiful photos. Those baked banana cheescakes look absolutely delicious! Thanks for linking to Heart & Home!